The U.S. electorate this year will be the country’s most diverse ever, and that is evident in several Super Tuesday states holding primaries or caucuses on March 1 in which blacks could have a significant impact. 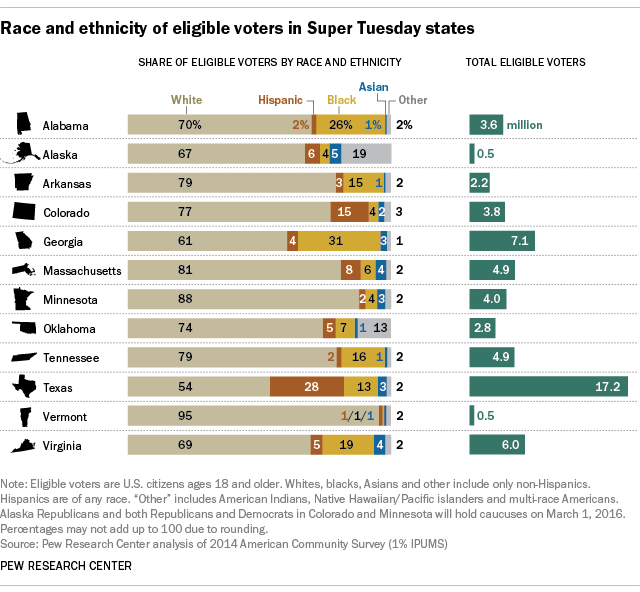 In five of 12 Super Tuesday states, blacks account for at least 15% of the electorate, according to a Pew Research Center analysis of 2014 census data. Black eligible voters have the largest footprint in Georgia (31%) and Alabama (26%), while Virginia, Tennessee and Arkansas also have sizable black electorates. In a reversal of historical migration trends, Southern states have seen their black populations increase more than twice as fast as non-Southern states since 1990. From 1910 to 1970, 6 million blacks left the South, with many pursuing industrial jobs in Northern cities in what is called the Great Migration. But since then, blacks have increasingly chosen to live in the South. Blacks far outnumber Hispanics among eligible voters in the five Southern Super Tuesday states with large black electorates. For example, among eligible voters in Georgia, 2.2 million are blacks, compared with 291,000 Hispanics and 179,000 Asians. Blacks have long leaned toward the Democratic Party, according to Pew Research Center surveys. In 2014, 80% identified as or leaned Democratic, compared with 56% of Hispanics and 40% of whites. Hispanics have a large presence in the Super Tuesday states of Texas and Colorado. In Texas, Hispanics make up 28% of the electorate and outnumber blacks 4.8 million to 2.2 million. In Colorado, Hispanics make up a rising share of eligible voters, standing at nearly 15% in 2014, up from nearly 13% in 2008. Overall, Hispanics favor the Democratic Party, but to a lesser degree than blacks. Exit polls in 2014 in some states showed significant shares of Hispanic voters supporting Republican candidates in races for governor and U.S. Senate. Several other Super Tuesday states have largely white electorates. For example, whites make up 95% of eligible voters in Vermont and 88% of eligible voters in Minnesota.